You’ve probably noticed that most workplaces are cleaned by a commercial cleaning service in New York. But, what you may not realize is that your home can be sanitary and clean like a professionally cleaned workplace if you know the right way to clean different types of floors. Here are the basics of cleaning common floors in either the workplace or home. Ceramic tiles can be relatively easy to clean if the tile is glazed. Glazed tile will resist almost every type of stain. However, unglazed tile is porous and can absorb most things, so spills must be cleaned up right away. You should avoid strong soaps or acids on unglazed ceramic. Concrete can also stain easily if unsealed. Kitty litter can absorb oil or grease and then the floor can be washed with water. 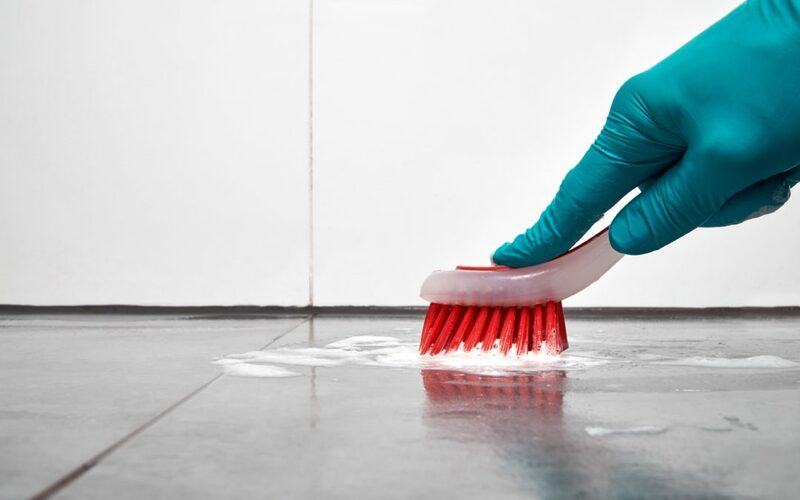 An all-purpose cleaner can be used as well, but the best way to keep concrete clean is to use a commercial sealer so that spills can be easily cleaned up. Linoleum flooring resists stains and can easily be cleaned with a simple cleaner. The important thing to keep in mind is that scouring, very hot water, and abrasive cleaners are not good for linoleum. The best way to protect marble is to have it properly sealed. Then you can clean up spills with just water. In some cases, a liquid wax will be needed to be applied occasionally to fully protect the floor from scratched and stains. Slate tile needs to be sealed to prevent stains from being absorbed. This means that you’ll need to periodically strip the wax and then reapply it. If you’re hesitant to do this yourself, you can call a commercial cleaning service in NY for help. Hardwood floors must be cared for a certain way because too much water and too harsh of chemicals can easily damage the floor and cause it to warp or crack. Even steam can damage hardwood floors. Commercial cleaners and waxes can damage the floor’s finish, making the underlying wood susceptible to further damage. Hardwood floors can be swept and vacuumed as long as the vacuum doesn’t have a beater brush. Use a damp rag or mop that can clean up remaining dirt or spills. Be sure the rag isn’t wet enough to leave water behind on the floor.